Progressives are outraged at the Trump administration’s attacks on civil liberties and economic rights—and the new DNC chair needs to funnel that energy. Disappointment in the progressive camp, after Keith Ellison’s narrow loss for chair of the Democratic Party, is palpable. Disappointment, because Keith had a credible answer for the challenge of how to channel the widespread revulsion at the Trump Administration into a potent force capable of driving the right-wing Republicans from office. That credibility rested on three pillars: his record of building a winning campaign apparatus in Minnesota, his commitments as an organizer, and, most important in view of the outcome, his ability to unify the party. He demonstrated that ability to unify on the platform drafting committee this past summer, where he, on behalf of the Sanders campaign, and I, on behalf of Secretary Clinton and organized labor, forged the strongest, most progressive economic-policy commitments in party history. Tom Perez won the vote. That poses a question for him, and one for progressives. What shall we do? He takes the helm of the Democratic National Committee at its darkest hour. The loss of 1,000 elections this decade has put Republicans in power almost everywhere. They’ve used their power ruthlessly, undermining voting rights, busting unions, attacking Planned Parenthood, and denying immigrants a path to citizenship. In consequence, Democrats can’t have a win that sticks without a robust majority. At the same time, the party itself, and the DNC, have credibility problems, especially with their base. The Republicans benefited last year from greater intensity of feeling and loyalty among their base. More Republicans felt compelled to vote, to defend their traditions, community, or values. The intensity is now greater on the left, as seen by the outpouring of protest, but Democrats are still at a loyalty deficit. Just think of the voter discipline throughout the GOP coalition, how many held their noses but voted Trump. Like the party itself, Perez has to win a credibility battle. Donald Trump was trusted more than Democrats on the economy, a startling outcome, considering how flawed a messenger he was. As the party’s spokesman, it’s up to Perez to lead an effort to get Democrats to campaign for the good jobs/strong unions populism of the 2016 platform, persuading voters to trust that Democrats will deliver if elected. The DNC was already an outspoken voice of resistance to Trump, and Perez is sharpening that line of attack. Some might expect that resistance will morph into electoral success in the midterms, just like it did for the GOP in 2010, but that is not guaranteed. The big majority Democrats need isn’t achievable unless they can mobilize midterm voters behind a fight on economics. And getting on the right message is only part of the battle. He also has to do all the things that Ellison promised. Ellison held out the promise of spreading the best practices of state Democratic parties, not just those who have been winning in battlegrounds like Minnesota, New Hampshire, Oregon, Nevada, and North Carolina, but also those in blue states who have kept them blue, and those in red states who are making gains, like Arizona, Kansas, and Georgia. Grassroots organizing was to be the priority. Ellison was prepared to partner with and raise the funds for parties in every state to rebuild, county by county; Perez should do the same. Ellison promised to build up staff capacity of the party, at all levels. If that is done, it will be less dependent on consultants, and less plagued by turnover of personnel. It could do a better job training candidates and staff, and building a pipeline of talent. Ellison’s ability to promote unity was his most obvious distinction. For organized labor, and for the grassroots left, support for Ellison was based on the deeply felt need to fix the Democratic Party. When Democrats lose, as Ellison points out in every speech, people get hurt. 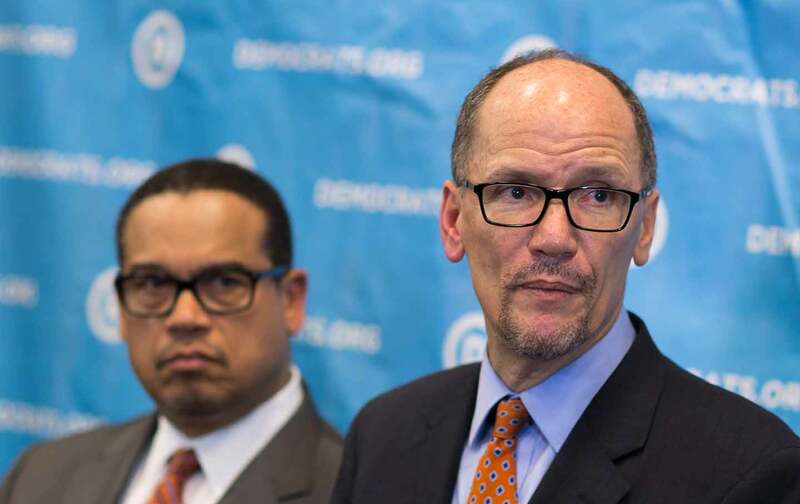 Though Perez might have an easier time convincing Obama’s circle to invest in party-building rather than in an independent apparatus like Organizing for America, for everyone else, Perez has a clear challenge. He has to welcome the left, persuade labor he’s going to bring change, share ownership and control with them as well as enlisting them. But we have to show up. If we don’t, the chance to win in ’17 and ’18 will be lost, the Republican stranglehold will tighten, and untold harm will be inflicted on the people of the United States. If we do, we have a chance. Maybe a slim one… but Trump had a remote chance in 2016 and made the most of it. Evangelicals were for Ted Cruz, who didn’t make it, but still they went all in. Business Republicans backed Bush or Rubio, who didn’t make it, but they went all in. All in, behind a leader they didn’t like, but they got a chance to govern, to stack the Supreme Court, and all the federal agencies, and to carry out most of the right-wing agenda. They went all in. So should we. Paul BoothPaul Booth is the executive assistant to AFSCME President Lee Saunders.